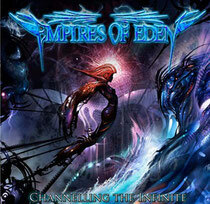 On April 3rd, EMPIRES OF EDEN has announced the release of the third album "Channelling The Infinite" from global recording project EMPIRES OF EDEN. Japanese release date of June 1 through Rubicon Music, rest of the world June 6 via Music Buy Mail. 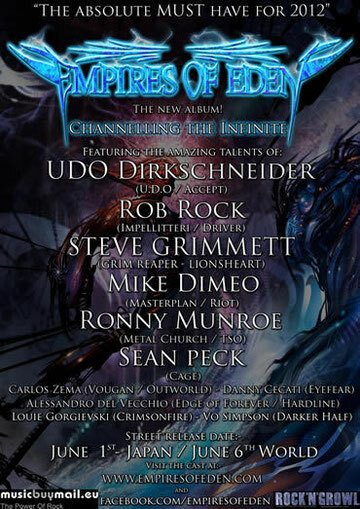 Conceived and orchestrated by Australian shredding maestro Stu Marshall (ex-Dungeon), the album features some of the most influential voices below in metal. Loaded with 12 tracks of brain-blasting power metal, "Channelling The Infinite" features killer production and powerful, hook-laden music that will appeal to any aficionado. Each song is carefully crafted specifically to suit the singer involved, and designed to best complement their range and style. From there, the vocalists have complete freedom to write the lyrics and melodies, providing a unique insight into what truly inspires these artists. Also available as a limited-edition Digipak that includes bonus tracks for each territory. Album cover artwork is done by L.A. based “Alex Ruiz” once again.